How to quickly set up Time Machine server on Ubuntu Server 12.04/14.04/16.04 and Debian without using extra repositories, unnecessary packages and redundant configuration. Backing up tested on OS X 10.6 Snow Leopard, OS X 10.8 Mountain Lion, OS X 10.9 Mavericks, OS X 10.10 Yosemite, OS X 10.11 El Capitan. If you have a problem, you might be able to find a solution in the comments section below the article. Update: if you try this in CentOS, replace apt-get with yum where necessary. If you need to install a new drive, follow the guide on Ubuntu Help. 3. Create a folder which will contain the backup. It doesn’t have to be located under /home or called “tm”. Do not touch “options:tm”! Obviously “volsizelimit:300000” limits the share to 300000 MiB (~314GB). (Finder will show “314GB available” when connected). Remove it if you want. Important! Make sure you’ve replaced /home/danny/tm with the actual path you chose in step 3. Otherwise you’ll be getting OSStatus 2 errors later on. Once again you’ll be asked for the login and password, after that you can disconnect from the share in Finder if you want, because Time Machine will open a new connection. (1) If you can’t connect to your server at all, try turning off the firewall if any, and see if connection goes through. If so, turn the firewall back on and try opening port number 548. If you get an error, repeat step 3. (3) If avahi-daemon does not start after rebooting the server (so the server doesn’t re-appear in Finder’s sidebar), change AVAHI_DAEMON_DETECT_LOCAL from 1 to 0 in /etc/default/avahi-daemon (more information in my post on ServerFault). Note that if it never appeared in the first place, probably it has a different problem. (?) If you’re facing a different problem, try catching possible error messages. On your OS X computer, open Console.app, click “Show log list” to open the sidebar and select “All Messages” there. (Ctrl + C to stop). Then try to connect and see if any suspicious or error messages appear. If so, mention them while asking for help via comments or forums. This entry was posted in How to’s and tagged macos, time machine, ubuntu server. Bookmark the permalink. Thanks alot man! It works great! I did this, and I’m getting an OSStatus Error 2 message, stating “Time Machine can’t access the backup disk”. Hi. I’m getting the same error. Did you figured how to solve it? The permissions are ok. I tried to copy a file into the shared folder using the same credentials and works ok.. There was a problem connecting to the server “lab.local”. Can you connect to your server via AFP? I have the same issue as Marco, can’t seem to get authentication to work. Any tips? Tried via AFP and still getting the same error. I have this same error. Did you manage to fix it? What did you do? gave permissions for my username. Thank you for this post. I know there are a few comments from those that had problems, but I found it worked a treat using a big fat disk attached to an O2 Joggler running Ubuntu 12.10, with Time Machine running on Macs using OS X 10.7 Lion and 10.9 Mavericks. For both my back-ups I made sure that the only thing being backed up on the first round was a small folder. 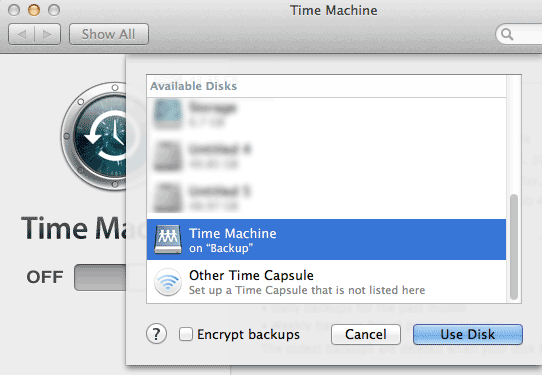 So you use Time Machine’s options dialog to exclude almost everything, then bring them in on subsequent back-ups. This just gets that first back-up done, so what follows is incremental. It did seem to take a long while at first to “locate” the backup disk, even though the share was listed instantly in the list of available disks for backup, it took ages to locate when actually backing up. To any who loose their nerve at this point, I suggest waiting before tweaking your settings and seeing if it completes. Thereafter it is quick. I haven’t tried restoring in earnest yet. But while I was migrating data from another backup on USB to a client’s mac, my Ubuntu Time Capsule was presented as a possible source of migration data in Migration Assistant. I run an iptables-based firewall on my fileserver – what ports need opened for this setup? I see that three different protocols are used; samba, netatalk, avahi. I am guessing here but I would look for the ports these protocols use. I got this to work and it great but I had two questions. First the initial backup is so long, I was considering to plug in my drive for the initial backup; can I then use that same backup on the server? Second can I do all this for another Mac device? can I then use that same backup on the server? I’ve heard that people do this, but I don’t know if there are any pitfalls. (1) Repeat step 6 on another Mac and use the same Linux user/password. This way, two Macs will be backed up to the same Time Machine share. This is easier, but not very secure: if you’re using Mac #1 and your friend is using Mac #2, you and your friend will be able to access files of each other through the backups. (2) If you want your Macs backed-up into separate shares, repeat step 2 and step 4. In Step 4 obviously you may skip the “Paste the following line” part because you should already have that line in your AppleVolumes.default file. but the folder names and structure mentioned there don’t seem to be the same. It seems that things are stored differently. I’m not sure I understand the part about folder names. My guide does not impose any specific folder structure. Keep in mind that OS X stores its backup in a “.backupd” file, that is a container with Apple’s proprietary HFS+ filesystem. By default Ubuntu cannot read HFS+ and thus it cannot read your “.backupd” container, until you specifically tune it to do so with additional packages and hacks, as suggested by your link. thanks, so simple. I had Tiger backing up to Ubuntu, but when I went to Snow Leopard it stopped and I couldn’t get it working again until I came across this. Now the mac is backing nicely and I go access back to those original backups from the tiger days! This is great help. Thank you. Andrew Zimmerman, Thanks for the solution! That wasn’t necessary for me. Working just fine in mavericks. For the record: I also needed to apply the workaround from Gary Corcoran to make it work on Mavericks (on a new system). Thanks, Gary! FWIW: On a new Yosemite iMac, I also needed Gary’s workaround. Thanks Gary! Thank you.. Your solution works for me too!! Cheers Gary and Dae.. You Rock!! If you getting the “OSStatus Error 2 message” message with an external drive try not auto-mounting the drive but instead use a system wide mount by editing fstab or using pysdm to do that. This is great. I have everything working (Yosemite) however ,when I try to connect to the volume it will not connect. I tried logging in with the user ID I setup for time machine and the password did work. I see the drive I even have the icon changed to the server, but it will not connect to the drive. I’m sure it’s a ID10T error but any input would be great – Thank you. Sorry password did NOT work. Does what it says on the tin: “without using extra repositories, unnecessary packages and redundant configuration”. Took less than 5 minutes to set up. Confirmed on Ubuntu 14.04.1 LTS and Yosemite. Even added –no-install-recommends to the apt-get install command to skip some more packages that are apparently unneeded. This guide helped me set up a Time Capsule share and add AFP to my NAS. Simple, clear and… IT WORKS on 14.04. Thanks for the guide! Mac is being backed up right now. An OSStatus 2 error was happening when first trying. Then came the realization of an ID10T error of actually pasting /path/to/shared/folder instead of creating, setting permissions and inputting my own path :). Thanks again! Thanks Ray, I’ve updated my post to include this step. Thanks so much for this! I’m running Yosmite and couldn’t get my time machine to work with by CentOS box, after following this, the backups are working! Saved me some funds for sure! Is there anyone who got this solved? Yes it’s reachable, just the afp isn’t. In time machine I can see the time capsule share and when I choose it, it prompts me to login. With correct credentials I get the error explained above and with wrong credentials it tells me wrong username or pass. 1. Can you check if the shared directory (in my article: /home/danny/tm/) is readable by the user you created in step 2? 2. Do any messages appear in /var/log/syslog on your server when you try to connect with correct credentials? You did not mention firewall. There’s still a chance that its a firewall issue even if you see the share in Time Machine. Cheers mate for your help!! that worked. And again I’m very sorry apparently this was mentioned before but I must have done something wrong. This time round it worked!! No prob! So it was a firewall issue? If so, you could try re-enabling the firewall (sudo ufw enable) and opening port 548 (sudo ufw allow 548). Sorry no, I ment to comment on the uams part. So that is what worked for me!! Cheers mate! Great, thanks! Now I can update my post. How am I supposed to connect to my server? – I connected to it via the “shared” tab on the side (It had my server’s name and icon) and used my username and password. – I could see the shared folder I made. – I can see it as a “shared folder” (I guess that’s what it is) when I look in finder at all of my drives. It has 314.57GB free. Hi Marley, while in Finder, press Cmd + K. A dialog window will appear, in its server address field type in afp://ip.address.of.your.server/ and press “Connect”. If everything’s ok it will ask you for login/password, use the ones you set up in step 2. Once connected, go to Time Machine settings and find the newly connected share. It connects, but the outcome is the exact same as before. Is the connected share writable? Can you make a new folder or save a file on it? Oh wow, I figured it out! Thanks for reporting back! You’re right, I should use a different folder name as an example. Added a warning to the article for now. However, I skipped this and instead just opened up Time Machine directly. It detected my server share and backup worked fine (I did the step with Avahi). I have OSX 10.10 Yosemite and did not get any “Check the server name or IP address, and then try again” error,”. So I didn’t need that workaround. Thanks for the comment, I’ve reworded step 7. Thanks for the post! Worked great. Thanks for this tutorial. I have installed everything and it works fine. 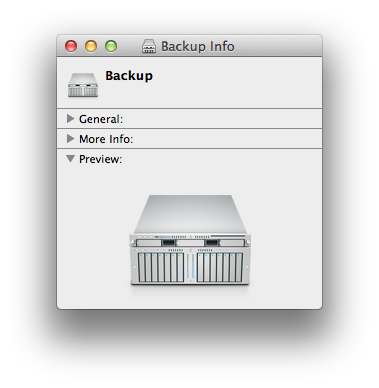 The backup is running as I type. You might want to edit step 3 as the chown command also needs sudo for most users. A few issues. To make time machine work, I need to connect to my server (Xerxes) over afp:// but then I cannot see my other shares. Is it possible to connect to the same server using both afp:// and smb:// at the same time? When I try, it opens the smb shares but does not show them under the shared item in Finder. It also appears to stop the backup when I do it as the afp:// appears to shut down. I am tying to set time machine up on a network server that serves a series of shares over samba as OSX has now moved to smb2 as default. I am sure I used to run smb and afp together in Ubuntu but for some reason it does not appear to be working for me now. thanks for the correction to step 3. I’ve switched to OpenMediaVault long time ago, so I’m afraid I’m not the best adviser on AFP issues. Try Ubuntu Forums or ServerFault. If this is so, then something went wrong. Time Machine should connect automatically, completely on its own, using separately stored login/password. You don’t have to connect to the server manually beforehand. I think it is a internal networking issue so I will move it to the Ubuntu Forums. I have selected the time machine disk based on the ip address rather than the machine name this time so I hope that might solve the problem. Not sure why it gave me the two options, probably a hangover from other methods I have tried to get this working that your solution has triggered into action. No need to reply. Thanks for the tutorial. It worked great w/ zero issues. Thank you for the great and easy tutorial! Works flawlessly on OSX 10.11.1! … with Ubuntu 14.04.3 as server. Got it set up in nearly no time on El Capitan / Ubuntu 14.04, works like a charm with three different Macs. I got this working with a single account, but if I want to apply this to a server meant for my family, can I use groups? So far, I havn’t been able to get this to work. Hi Dae, just to let you know that I gave up using a network user and started using a local user according to your instructions (haven’t realized before that I could use any password on account creation). Worked like a charm, thanks again! Best, Daniel. Works for me – thanks! Works for me on Ubuntu 16.04 / El Capitan. Thanks! Works for me on Ubuntu 16.04 / Sierra. Thanks! Did not work for me with 14.04 / Sierra; updating to 16.04 seemed to fix the issue. It works, but very slow. ~20gb in 24h . Some one have a clue? i have the same problem. Very Very slow backups via Gigabit netowrk. Works like a charm in Ubuntu 16.04 customized to MythTV 2T drive set up just for TimeMachine. Thanks for this tutorial. This works great on 16.04 and macOS 10.12.6 (Sierra). This worked much better than more recently published guides. I tried it on Ubuntu 18.10 it works like a charm. Thank You.